Etobicoke residents can depend on Shack Shine for a comprehensive level of clean! Shack Shine is the exterior house cleaning service in Etobicoke residents can count on to get their home to be the shiniest home on the block. Our smiling, uniformed technicians are happy to arrive at your home in shiny, organised trucks to scrub the exterior surfaces of your home in one detailed visit. We make it easy for you to get all of those tasks you need complete done on time and without delay. You deserve a sparkling view out of each of the windows on your home. We can make that happen for you. We offer interior and exterior window cleaning services that keep you off the ladder. Our team uses a powerful squeegee tool that helps to scrub your windows clean. We wipe down the frames and screens, too. Window cleaning services from Shack Shine are available even if you are not home. We’ll take before and after photos to show you the work we’ve done for you. You’re busy and you have a long to-do list. That’s when you call Shack Shine for house detailing in Etobicoke. 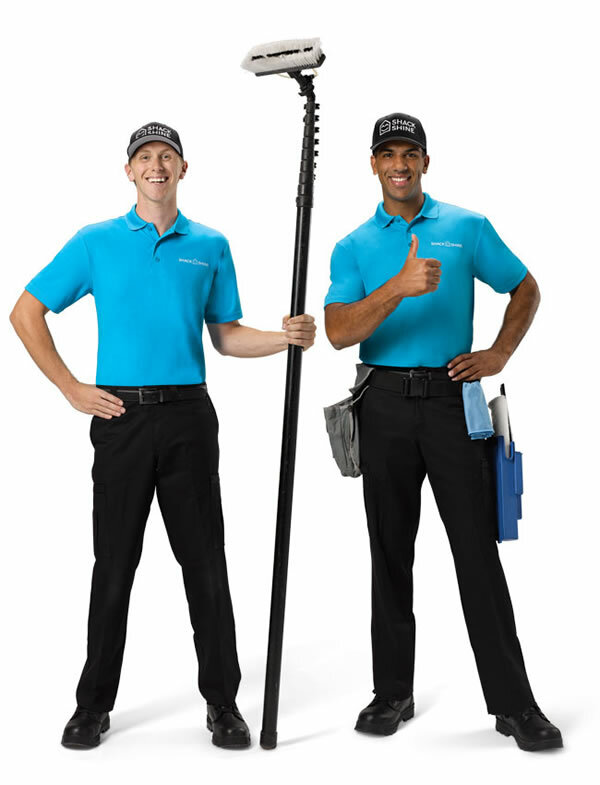 Our eavestrough cleaning service is the easiest way to remove all of that built up grime and debris in your system. We use a high-powered vacuum attached to a large canister to remove all of the buildup. This ensures water can flow properly away from your home after every storm. Your home will love you for this service. A key component of our Etobicoke exterior house cleaning service is house washing. We offer several methods to help you including a soft wash and hand wash option for more delicate surfaces. We use a moderate about of pressure washing to clean brick and vinyl. You’ll have a like-new looking home without having to lift a finger. House washing is essential. It helps to prevent early fading and damage to siding and brick. And, we believe, a happy home creates a happy family. Roof cleaning ensures your roof tiles do not wear out too soon. Our technicians use just the right amount of pressure to wash away all of the buildup of materials on your roofing tiles. We remove mould and mildew buildup. We’ll also remove all of the moss that could clog your eavestroughs. Your roof will look fantastic and your roof will sparkle. To tackle all of the exterior surfaces around the exterior of your home, put Shack Shine to work for you. Our house detailing Etobicoke service includes power washing. This is an eco-friendly way for us to remove grime and buildup from many of the surfaces around your home including driveways and pathways. Shining your neighbourhood, one home at a time – even one driveway at a time. Let Christmas lights bring a bit of sparkle and festivity to your home. Our Shack Shine technicians can install 100% customized Christmas lights to ensure your house is shining brightly to greet guests this holiday season. We offer high-quality commercial Christmas lights that shine brighter, lasts longers and are energy efficient. After the season, we will return to take down the lights and pack them away neatly for easy installation next Christmas. I have spent the past 25 years learning the art of customer service. Listening to what a customer wants and then helping provide solutions to problems is the foundation that I use to build my future business and personal relationships on. I have worked in the courier industry for 15 years and it taught me how to resolve conflict and how to provide a friendly professional service that people both want and expect. It was this experience that had me take what I learned about service and then build and apply it to a different role which I furthered my skills, knowledge and managing style that lead to a role of VP of Operations and Sales. 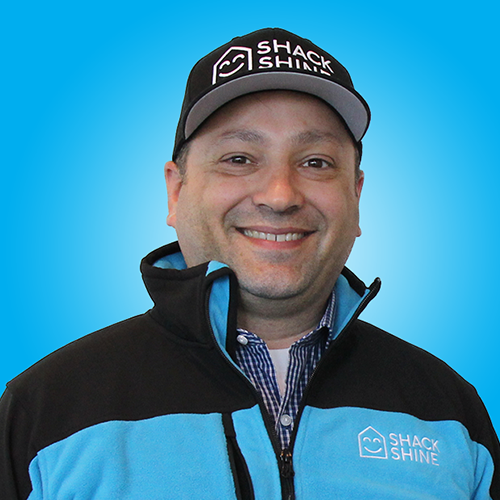 My desire to be an entrepreneur lead me to discover Shack Shine. With a great brand and using the skills I have learned, I know that this is a cultural fit that will benefit not only us in business, but our customers who deserve to have a great home detailing experience.